Be on the alert for a suspicious email purportedly sent from “webmaster@middlebury.edu” with the subject line “Web Mailbox”. This is a confirmed phishing message, designed to trick you into divulging your username and password. If you find a copy of this message in your spam quarantine, please ignore it. If you find a copy of the message in your inbox, please delete it. If you find this message in your spam quarantine, do not release it. It will be deleted automatically in the next few days. Do not click on the links in the message or reply to the message. 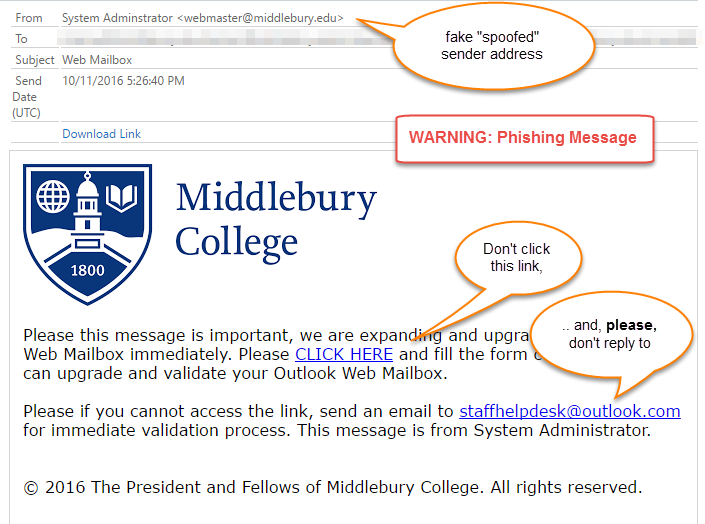 For more information about phishing attacks, please visit http://go.middlebury.ed/phishing. For more information about the spam quarantine, please visit http://go.middlebury.ed/spam. This entry was posted in Helpdesk Alerts, ITS, libitsblog, LIS Staff Interest, lisblog, Middlebury Community Interest on October 12, 2016 by Chris Norris.